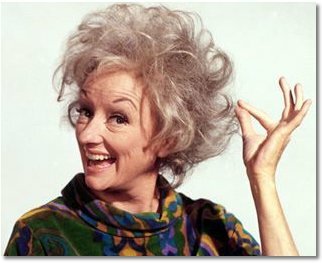 Phyllis Diller is, in my opinion, the original domestic goddess and queen of one liners! Born to an insurance man in Ohio, I thought it most appropriate she kick off my Funny Friday! The reason there are no women football leagues is that 11 of them would never wear the same outfit in public. Photos of me don’t do me justice. They just look like me. Robert Redford once asked me out. I was in his room. No matter what you look like, marry a man your own age. Then as your beauty fades, so will his eyesight. They say that housework can’t kill you, but why take a chance!? The best way to get rid of kitchen odors is to eat out. My cooking is so bad that my kids thought Thanksgiving was in memory of Pearl Harbor. Cleaning your house while your kids are still at home is like shoveling the sidewalk before it stops snowing. Be nice to your children because they will be the ones who will choose your rest home. Tranquilizers only work if you follow the instructions on the bottle – keep away from children. If it weren’t for baseball, most kids wouldn’t know what a millionaire looked like. I have so little money in my bank account that my scenic checks show a ghetto. When the pro tells you to keep your head down, the real reason is so you can’t see him laughing at you. What do you think her take on a fat burner would be? Phyllis was the queen. Although I have been told when I was young, by my Dad that she was also really dirty in her stand up gigs in Vegas, and Tahoe. Watch her on the Dean Martin Roasts. Now, the queen is Ellen DeGeneras–really funny, without being overtly dirty. Have a Memorial. Thank God for our troops, past, present, and future. .-= Don E. Chute´s last blog ..FEDERALIST FRIDAY 5.28.2K10 =-.